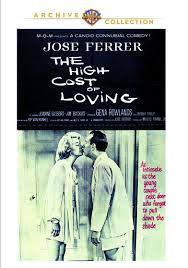 Co-starring with Jose Ferrer, in one of seven films the actor would direct, Gene Rowlands makes a solid screen debut in The High Cost of Loving (1958). This low-key comedy can sometimes be a bit too leisurely, and occasionally loses momentum, but the maneuverings and intrigue in its office settings ring true. The film is now available of DVD from Warner Archive. Rowlands and Ferrer are Jim and Ginny Fry, an affectionate couple who have enjoyed a peaceful nine year marriage. Their placid lives are shaken when Ginny discovers she may be pregnant, and Jim finds himself in doubt about his status at his company, which has recently been purchased by a wealthy conglomerate. The opening scene, in which the couple wakes and prepares for a new day, is a precisely calibrated amusement, perfectly demonstrating the synchronization that comes naturally to the pair. It begins when the alarm goes off, and Rowlands hand stretches across the gulf between their two beds, prodding her husband awake. The next eight minutes are silent as they dress, bathe, eat and read the paper. They are a team, trading duties: she brings him orange juice in the shower, he makes the coffee. After years together, they are wordlessly affectionate, comfortable enough to allow each other the space to begin the morning in peace. This sequence tells you everything you need to know about the couple as the story unfolds. When they finally speak to each other, Ginny reveals her suspicions about the pregnancy. Jim is stunned, after years of trying, it is an unexpected prospect. Though he is happy, you wonder if he realizes that in nine months, their mornings will never glide along with that kind of efficiency again. While the couple waits through a series of tests to confirm Rowlands condition (including the truly horrid rabbit test, which is fortunately long out of use), Ferrer faces another kind of suspense at the office. The new owners of his company are diligently working to determine which employees are valuable to the organization. While Jim has been a success in his department, he finds he has not received an invitation to a luncheon for those employees who are found to be top tier. Bouncing between post-doctor visit calls from Ginny and distressing, confusing revelations at the office, Jim becomes paranoid. Though certain of his value, he isn't privy to the closed door meetings between executives, and he becomes increasingly certain that he will not be promotes as he had hoped. He even fears being fired. These scenes will be all too painful to anyone who has endured the gossip, miscommunications and unpleasant surprises to be found in a changing business environment. While the office intrigue can be fascinating, the constant miscommunication, or even lack of communication can become tiresome. You begin to wish that everyone would get into one room together and take a few minutes to hash everything out. The simpatico relationship between Ginny and Jim is a welcome oasis from the insanity of the company maneuverings. In her screen debut, Rowlands is far from the complex roles that would define her persona, but she is a confident movie actress right from the start. It's not a showy part, but she gives her character a quiet strength and intelligence that feels ahead of its time. Though Rowlands and Ferrer have a cozy chemistry, I never could get past their significant age difference. With nearly thirty years between them, they seemed more like father and daughter. Still, their affection feels authentic and their partnership appealingly modern. Always in sync, even down to the way they make a midnight sandwich together, they demonstrate how a marriage can stay strong throughout considerable stress. It was also fun to see future television stars Nancy Kulp and Jim Backus in supporting roles. Backus had some of the most unusual lines in the slightly quirky script by Alford Van Ronkel (the screenwriter clearly has a sense of humor, he is credit as Rip Van Ronkel). You really have to pay attention when he says, "I don't mean to mow your lawn, but I think you should leave your hat where it's hanging, staking a claim worth mining might be difficult right now." It takes a talented actor to handle a mouthful like that.